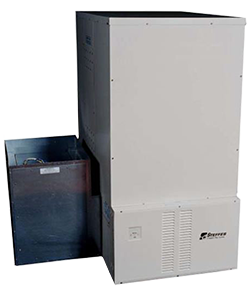 The Steffes Comfort Plus Commercial Forced Air Furnaces (6100 Series) are ducted heating systems designed to stand alone or work in conjunction with a heat pump for increased efficiency. Our Electric Thermal Storage (ETS) technology allows the Comfort Plus Commercial Forced Air Furnace to convert electricity to heat during off-peak hours, when the demand for and price of electricity is low. Specially-designed ceramic bricks within our units store vast amounts of heat for extended periods of time. With this heat storage capacity, the Steffes Comfort Plus Commercial Forced Air Furnace can deliver clean, consistent heat 24 hours a day. In addition, by only consuming electricity during off-peak hours, the unit can lower your electricity by up to 70 percent compared to traditional heating systems. All Steffes Comfort Plus Commercial Forced Air Furnaces are equipped with a variable speed blower to ensure consistent, even temperature output and meet your comfort requirements. For even greater efficiency all Steffes Comfort Plus Commercial Forced Air Furnaces can be equipped with a heat pump system.